Do you have enough......resources, time, love, relationships, margin? You can find freedom from the fear of not having enough! Jack drills deeply into the topic of fear and helps us identify where we are in our belief systems and how to move into the freedom of the abundant life Jesus promised.....I highly recommend this book, as I know it will be a guide and an encouragement. - Ron Blue, founding director of Kingdom Advisors and Ronald Blue & company; author of Master Your Money. Jack Alexander insightfully illustrates how true security comes from knowing and believing in the Lord who multiplied the loaves and fishes, giving us the confidence to reach out to others as he calls us to do. - Jim Daly, president of Focus on the Family; author of The Good Dad. 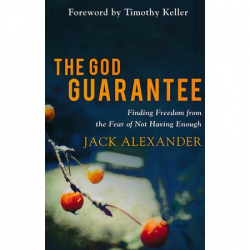 In The God Guarantee, Jack Alexander exposes fear as the underlying enemy of generous living and giving. He calls us to trust God and value community, and he makes it easier to do so with the perspectives he brings and the stories he tells. - Randy Alcorn, author of The Treasure Principle.